Besøg Firenze og Toscana ved opholder sig stille og roligt på landet, blandt olivenlunde og vinmarker, med panoramaudsigt over Firenze og Chianti bakker. Centrum af Firenze er kun 12 km. og er let tilgængeligt med bil (kun 20 minutter), eller ved hjælp af den offentlige transport i byerne. Faktisk kun 7 km væk, med mulighed for gratis parkering, der er en buslinje, der tager dig direkte ind i centrum af Firenze. Siena, San Gimignano, Volterra, Pisa og alle de kulturelle steder i Toscana kan nås hurtigt og komfortabelt. Tuscany Just like you’ve imagine it! We had such a lovely time at this beautiful farmhouse! The apartment was exactly what we needed to unwind and get away from our busy lives. The property was just as advertised - probably better- and wonderfully clean. They had everything needed to cook at home, but there were also great Tuscan restaurants very close. Simona and Roberto were fabulous hosts as well and available for all of our requests. Thanks to both of you for such a lovely time - we will return! L'endroit de rêve idéal pour des vacances ! Que demander de plus ? Le sourire de Simona? La gentillesse de Roberto? Ben, non, puisqu'ils vous donnent tout ça dés votre arrivée. En conclusion , le paradis ! On aimerait revenir ! We really loved our time here and Simona and Roberto were very generous and accommodating hosts. The property is beautifully kept and very spacious so you can walk around the olive groves and relax for a whole day without needing to go into the tourist spots. Very friendly chickens. And we had a great BBQ and dinner under a covered table. Fabulous! We would love to come back. Thank you. Wonderful hosts, comfortable and well-equipped apartment, beautiful location. 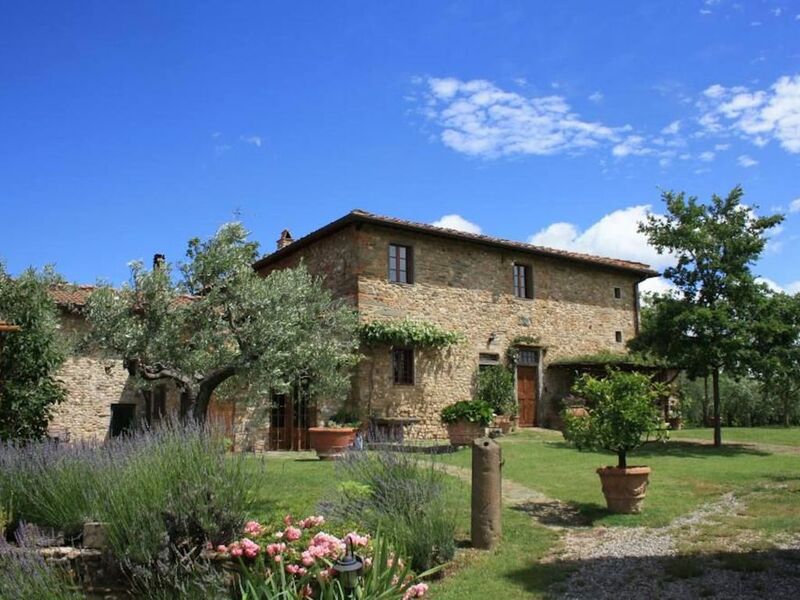 Couldn't have asked for anything more from our stay in Tuscany 😀 Simona and Roberto were most welcoming and very helpful hosts, would highly recommend! We had a wonderful, relaxing stay. Our hosts Simona and Roberto were absolutely fantastic. Told us how to get to places, where to go and even had local bus tickets we could buy! We were fortunate to be there during the Siena Palio which was amazing, a must if you there at the right time. Siena is only about half an hours drive away. We visited Florence by bus and then caught the train to Pisa. The farmhouse is in amongst the olive trees and grape vines. They produce their own olive oil and they have bottles of wine made from their grapes, both of which were excellent. Magnifique maison au milieu des vignes et oliviers. L'appartement est très bien équipé, climatisé et d'une propreté impeccable. Emplacement idéal pour visiter Florence (ligne de bus pour le centre à quelques kms), Sienne, Pise, région Chianti. Merci à Roberto et Simona pour leur accueil, conseils et leur gentillesse pour rendre notre séjour parfait. Nous recommandons chaleureusement cette adresse! Tag Firenze-Impruneta afgangen af ​​Highway A. 1. Tag SS 2 mod Tavarnuzze-Greve. Placering '"The Scopeti" drej til højre i retning af St. Andrew i Percussina. Efter St. Andrew i Percussina drej til højre retning Chiesanuova: mindre end 100 m fra krydset, til venstre, en lille grusvej fører til gården. Lille familiedrevet gård. Ideelt sted for turist udflugter, kulturelle og gastronomiske, i hjertet af Toscana. Please contact the owner for stay less than 7 nights . Per preventivi di soggiorni più brevi di 7 notti contattare il proprietario. Para estadías de menos de 7 noches contatar con el propietario Tariffe in funzione del numero di persone, Caparra richiesta alla prenotazione, Check in dalle 14 in poi,chekout entro le ore 10.